Have you ever considered what your life would look like if you gave yourself permission to do/be/experience all the wild, crazy, & beautiful ideas you’ve thought of? • Create medicine media and art that reflects your journey, process and power: Tap into the infinitely rich well of your creative and sensual essence through the creation of art medicine videos, photography & art making. How would your life be if you actually gave yourself permission to not give two fucks about others, and moved to that other country, started that venture, or cut off all of your hair and wrote your tell-all memoir? This my love, is the beginning of the Wise, Wild & Free Self. It’s a 9 Month Mentorship where I lovingly hold your feet to the fire, stand in your corner, and stand for your deepest, boldest, and untold prayers and visions so you can become the blazing fire you were here to become. Over the past four years of rocking my soulful life's work, I've learnt countless lessons, endured lots of mistakes, and experienced exponential growth in my heart, soul, and career. I've invested tens of thousands of dollars into my growth, held events for hundred of people (in gorgeous locales), made major business mistakes that cost me hundreds of thousands, made hundreds of thousands of dollars, and been featured on TV, radio, and other media. I've experienced the elevation of major exposure and made major PR mistakes that attracted lots of criticism. Amidst all of the highs and lows of owning my own business, the things that have kept me centred, grounded, and in a state of love, appreciation, and trust in myself, others and source has been my spiritual practices, my soul sisters, and my mentors. It is in this wisdom that I desire to support you in the growth you are ready to experience - and share some of the knowledge I've experienced so that you can carry forward in your mission with pleasure. I'm here to remind you of your Radiance so you can then hold your torch high for others. Our Journey is structured into a container of nine months, with a three month integration space and a final check-in at twelve months. All great things are birthed during nine months, and it's the span of time that allows for our connection to deepen into one of trust, play and playing full-out while you're also able to witness the massive leaps and bounds you make. 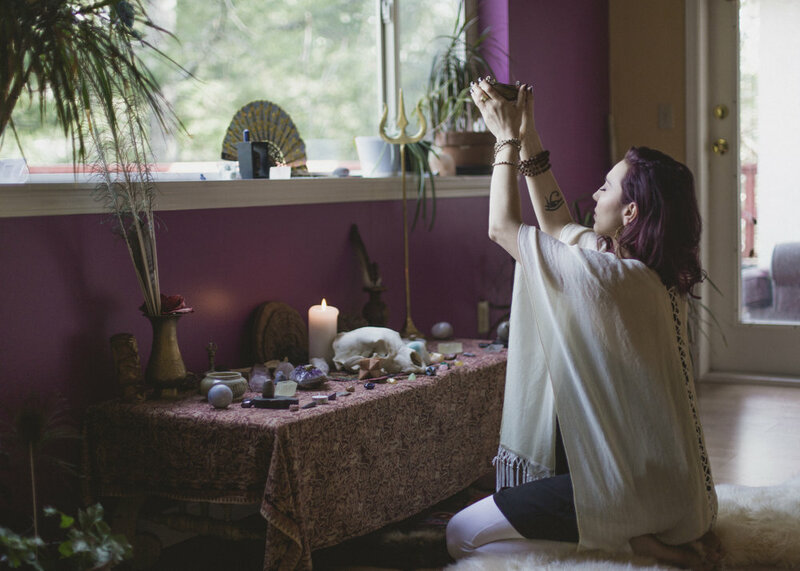 • Your Mythic Self: We explore, discover, and welcome home the archetypal aspects that haven't had the space to be heard, embodied or witnessed in your life including: The Dark Feminine, The Priestess/Magi, your Galactic Avatar and Mythic Self. We explore and commune these aspects through embodied creative practices, rituals, and ceremonies that will draw out and support you in integrating these powerful aspects. • Clear Vision Map: You'll identify 3 Major Goals/Desires that will be your North Star during our time together, whether that's writing your first book, launching a new offering, or working remotely. • The Mechanics of Reality Mastery: We'll cover the foundations of intentions and their influence on your reality, soul mate client attraction, and the general foundations of maintaining your desired energy frequency, tuning into energy, and working with energetic principles. • Your Core Message, Mission & Impact: How are your offerings providing you with the most joy, financial nourishment, and impact in the world? We'll architect your sacred business in a way that feeds your soul, nourishes you financially, and provides deep and meaningful value to your community and clients. • Self-worth and the connection to your pleasure, prosperity and purpose: We actively and courageously explore the connections between your desired experience of full self-love and the expression of your self-worth through your ability to receive pleasure and miracles, prosperity and experience ease daily in your life. • Final Review Session & Future Self Strategy: At 12 months, we'll have a follow-up 2 hour session to reflect on your past year and also celebrate the courage, boldness, and expansion you've experienced. We'll go over your visioning for the next year ahead, and get further clarity in your soul's grander journey. • 2 Hour Soul Visioning Session: This is our first session where we go high-level and map out your North Star for your energy, relationships, embodiment, career, and desires. • 3x 90 min Sessions over 9 months: These are a combination of embodiment journeys + strategy sessions where we'll work through your resistance, dance through fears, and embody your desires. • In this delicious and fun retreat, we'll explore the soul of your mission, pull out the golden threads of your messaging, and uncover the heart of your greatest offerings to the world. In between there will be lots of time to soak up the sunshine, hit the ocean, and bond over yummy food, chat long-term visions over manicures and even hit the dance floor to get into our Shakti. To top off your weekend, you'll get to celebrate your magic through a breezy and luxurious photoshoot session and walk away with photos that capture your radiance and magic. You'll come away from this retreat with valuable content for your website and offers, more clarity and confidence in your mission, and the embodiment of your magic in a luxurious and archetypal photoshoot. Includes accommodations, food, retreat perks plus photoshoot. If this path is tugging on your soul, book your Free Exploration Call here to see if this is right for you and for more details. There is one space available for the remainder of 2018, so please book a free call to determine if this option is best for you.